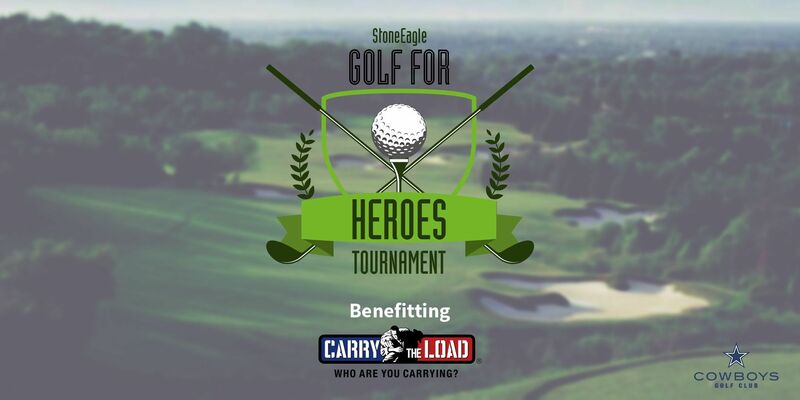 StoneEagle is proud to announce the 1st Annual Charity Golf for Heroes Tournament benefitting Carry The Load. Carry The Load’s mission is to provide an active way to honor and celebrate our nation's heroes by connecting Americans to the sacrifices made by Military, Law Enforcement, Firefighters and First Responders. StoneEagle is hosting the tournament in conjunction with the 2017 Industry Summit taking place at the Gaylord Texan, less than a mile from the golf course. Where: The Cowboys Golf Club in Grapevine, TexasTournament Format: Four Person Team Scramble (prizes for 1st, 2nd, and 3rd place teams) Terrific prizes awarded to the winner of the following contests: · Longest Drive (Scotty Cameron Newport Putter) · Closest to the Pin (Bushnell Rangefinder) · Hole-in-One (Trip to Super Bowl) · Putting Contest (Yeti Cooler) Schedule of Events: 11:00 am - Player Arrival, Range Open, Lunch Provided 1:00 pm - Introduction, Rules, Speaker from Carry The Load 1:30 pm - Shotgun Start 6:00 pm - Dinner, Raffle Prizes, Awards NOTE: Club rentals are available from The Cowboys Golf Club. Please contact them at (817) 481-7277 to make any rental arrangements. Deadline for Player Registration is August 25th, 2017 and is limited to 72 players on a first come first serve basis. If you're unable to attend, but would like to make a donation to Carry the Load, please use the "Tickets" button and enter your donation amount for Carry The Load.